From the exposure many Ugandan musicians such as Navio, The Mith, Keko, Lillian Mbabazi and Maurice Kirya are receiving on Twitter, it would not be inappropriate to say that popular Ugandan music is experiencing a boom in Africa. Unfortunately, this has exposed their largely Western aspirations, creating the daunting questions such as: Who is the audience on Twitter? Which culture does one produce for? And, is it possible to produce a cultural following on Twitter? These musicians, along with a few others like Jackie Chandiru and Juliana Kanyomozi, are quite different from those in the dancehall phenomenon that has virtually destroyed Uganda’s music industry with its failure to develop any original meaning for Jamaican dancehall in Uganda’s context—in the same way that reggae did through the music of Lucky Dube. Instead, they echo a cultural utopia that occurred during the 1990s on Wilson Rd in downtown Kampala, characterized by fashion, music, film and poetry that drew specific influences from American 1990s rap/R&B (such as Blackstreet, Junior M.A.F.I.A, Boyz II Men and the neo soul musicians), most of whom were located in Brooklyn, New York. However, I would like to point out that it would be virtually impossible to identify, or even develop, such an American culture in Uganda, had it not been for the close curatorial skills of Sanyu and Capital FM’s radio Djs. They made very specific choices as to which culture and which music they produced on the radio, leading to the growth of an African styled harlem on Wilson Rd of 1999. This movement produced several current poetry and music stars such as Xenson, Navio, Juliana Kanyomozi and Iryn Namubiru who reflect such influences in their music to date. Have one look at the new album cover on which a sternly looking Xenson wears a leopard print suuka, puts a very clever spin on the mink fur coats that have become emblematic of Notorious B.I.G (another 1990s Brooklyn rapper). As evidence of a growing Afropop culture on Twitter, all the musicians that I have mentioned above have a large following on the social media website. The Mith has 4,499 followers, while Lillian Mbabazi’s are 5,900; Radio & Weasel’s 3,420; Keko’s 14,961; Navio’s 8,393 and Maurice Kirya’s 12,107. Evidence of this culture on a continental level is on The Afribiz Chart, a website which curates artists such as Nigerians Tiwa Savage, Banky W and 2Face Ibidia, all of whom have had contact with 1990s American R&B. Ugandan duo Moze Radio & Weasel were placed at No. 2 on this week’s chart in the company of Banky W and 2Face at No. 3 and No. 1 respectively. The Afribiz Chart considers artist presence on social media including Twitter, Facebook and Youtube as well as digital sales. It also markets itself as ”Africa’s #1 official music chart”. The Twitter sense of bridging the gap between artist and listener is what Maurice Kirya and other musicians alike are aiming for. However, it is not a completely new phenomenon, because it was part of the cultural hub of Wilson Road in the 1990s through fashion, modeling, music and film.On any given day, you could walk down that street and see fashion that you had seen in the music videos of Jennifer Lopez, TLC, Jay-Z and Blackstreet on a TV Show like Jam Agenda. It was as if the models on the street like Eva Mbabazi had jumped straight out of a music video on TV and had come to life. It was only logical for Sanyu FM to produce the R&B culture Bash in 2001 at Munyonyo Resort, because they had been the first radio station to play the R&B produced by Ugandan musicians like Steve Jean and I-Jay. This is what Twitter has substituted in the form of allowing musicians to debut content via mp3 away from the radio and getting a really personal bird’s eye view on the life of a Ugandan pop star. Twitter has become a platform on which Ugandan musicians can brand themselves before the audience. They can talk about what they wear, what they eat, where they have their coffee, where they hang out on the weekends, and even share gossip before media tabloids issue melodramatic news stories of the same content. However, I wonder how a single musician can create a whole culture on their own? What is known as a brand is simply a particular type or kind of something. If a musician like Maurice Kirya can define the specifics about the culture he produces, then it is easier for his followers to accept his music. This is, in all purity, only about the proximity of musician and music fan. What the music fan would not be able to read about on a blog (I do not know of any blogger or journalist who would ask if Mr. Kirya makes music while making an omelet), he would be able to find out from his Twitter. The purpose of this in terms of producing culture, is that the follower would think that Mr. Kirya’s music is, to use an unavoidable term, “so cool” because it comes about while Kirya makes his breakfast omelette. It has nothing to do with the fan, but has everything to do with the musician’s brand and producing culture. In close reference to 1990s Wilson Rd, one of the only reasons musicians, radio DJs and socialites walked down that street was in order to be seen: To be seen flirting with an interesting character; to be seen wearing a kind of shoe, perhaps a designer product from America; to be seen driving a big bike. It was all part of branding their music. It was the moral equivalent of big brand advertising in magazines by promoters, showing high gloss photoshopped imagery of the musicians. It was the equivalent of producing and creating a public image, and more importantly associating that image with a specific culture. The problem with photoshopping celebrities in the magazines is that they do not look like this in person. Many musicians have fallen in the trap of living up to how music promoters have represented them. It is important to note that this wardrobe has probably been selected by Kirya himself and not some magazine editor. It is also worth knowing that the fans who will read the tweet have probably listened to his music. This is definitely effective branding because they will quickly associate the image with Kirya’s music. For the most popular R&B Afropop musician online, Tiwa Savage, the following tweet will directly impact on how her music is experienced to all her 254,000+ followers. And yet, one cannot mistake the American influence of the words “diet” and “cupcakes”. But when a Nigerian or Kenyan music fan looks at this tweet, they will closely connect Tiwa with the likes of Paris Hilton and Nicole Richie who are notorious in the American tabloids for outrageously strange diets. 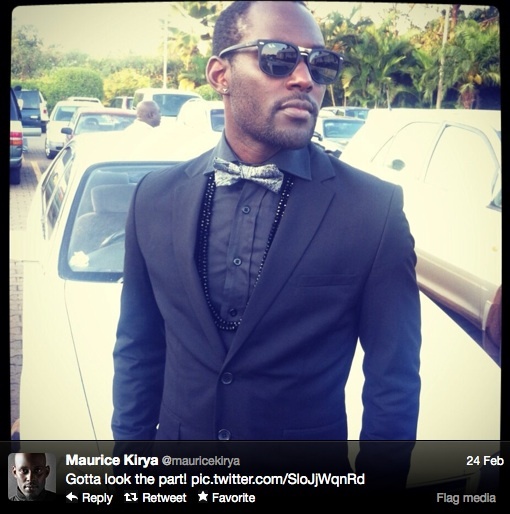 However, the following image posted by Mr. Kirya makes way for a very interesting conversation. How many of his followers would associate his “Mwooyo” music with a vegan diet? I think that we have become so accustomed to imagery in the media that these pictures, though very distant, make us want to closely fabricate the reality inside them. For a music fan, it is not mandatory, but has become the norm, to dress like a musician one follows by looking at their fashion in magazine spreads, on CD covers and on the Grammy red carpet for example. It is not always considered that the images pushed out by celebrities actually have a strong impact on their audience. 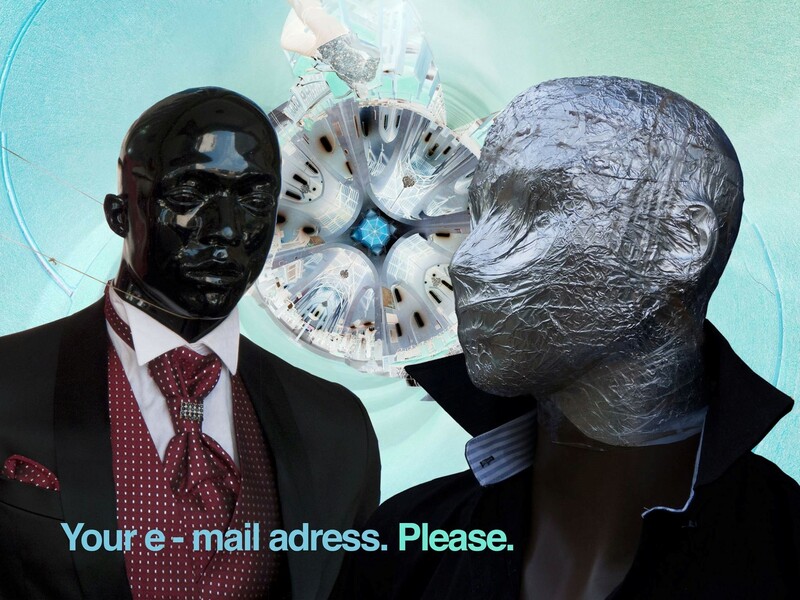 So the question is, what if this reality cannot be recreated by the audience? This creates a definite problem. Just as Justin Bieber tweets about how his relationship with his “beliebers” is “direct” and can’t be broken, it is not always possible for the “beliebers” to measure up with Justin Bieber’s lifestyle, especially if it has been dictated by a brand manager. Because they are indeed “beliebers”, they will often copy his dress style and more. However, when the same problem is attributed to a Ugandan audience, and Mr. Kirya is asking them to eat broccoli in addition to counting calories, isn’t it going too far? I remember how in one very famous YouTube video from 2007, a fan of Britney Spears called Chris Crocker cried bitter tears yelling out for news media to “leave Britney alone”. That video was extremely scary, because it assumed that Crocker was experiencing the same reality as Britney Spears, and could almost “feel” what she felt when the tabloids would talk about her weight issues or her career. 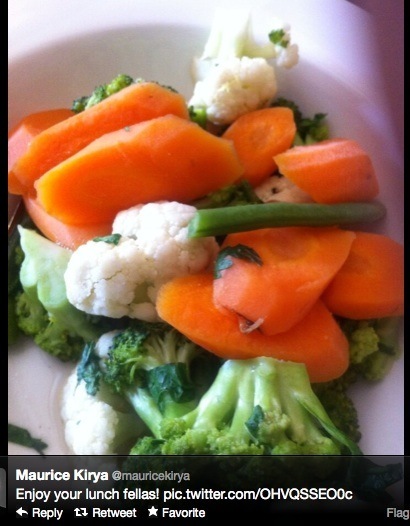 Though it is all well and good to be one’s own brand manager and to generate a cultural following on Twitter, what happens when the audience is misled into believing that a vegan diet is a very normal way of living —and the proof is given in pictures of broccoli and carrots? I personally think it is a morally wrong choice for music branding, as it falsifies the reality in which both musician and music fan is living in. In Uganda, we do not have an overwhelming number of obese children because high protein food is available everywhere, and fast food chips and burgers are still too costly to be easily afforded by the working class. Vegan diets should also be overseen by highly paid health professional which many Ugandans cannot indeed afford. The American influence on Ugandan music and music brands shows through such moral displays on Twitter. Perhaps too deeply. As much as personal initiatives via social media to effect music branding are quite effective, it is in the best interest of the public to retain moral authority to represent an attainable reality. In this photograph of Zari, another artist of the R&B Afropop camp, this unattainable reality becomes slightly hilarious or perhaps even obscene. Here, the musician attempts to throw off her fans. It is very unlikely that the few Ugandans who can afford Lambourghini’s listen to Zari’s music. In this portrait we can see clearly that majority of Uganda’s elite (for lack of a better term) aspire for the West, and hardly pay attention to Uganda itself. In order to show a clearer picture of the influence that Ugandan musicians can have on Twitter, I look at the Twitter Counter Website, looking at the most followed persons within the world and Africa. 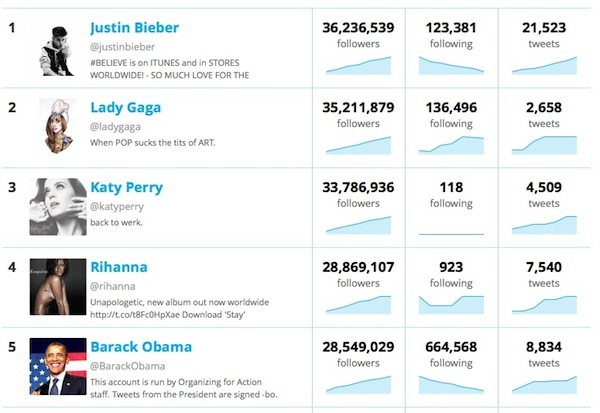 Twitter Counter which makes lists of the most followed in a Global Top 100, informs that Justin Bieber is the No. 1 most followed account with 36,236,539 million followers. Barack Obama is only No. 5 on that list. This an interesting observation when judging which culture these two social figures produce. Most Ugandans and Kenyans actually follow news media houses NTV and NTV Uganda, the latter which has 41,219 followers on Twitter. This perhaps explains the audience as not paying enough attention to musicians, and therefore Mr. Kirya can get away with tweeting about broccoli, vegan diets and counting calories. It just does not reflect Ugandans’ political state of mind, and can easily be ignored. South Africa reflects a different framework because the second most followed Twitter account in Pretoria, according to Twitter Counter, is Trevor Noah, a comedian described as the South African Michael Jackson, with 744,345 followers. Such figures prove that South Africans do take comedy seriously enough, considering that President Zuma comes only later in the Top 10. It would seem that South Africans in Pretoria have a balance between culture and politics looking at their Top 10 most followed personalities on Twitter. In comparison to Ugandans who follow NTV most, it shows that Ugandan society consumes more media and politics and therefore is less commercial. This is false because, Uganda is one of the fastest growing economies owing to growing capitalism within the country. Proof of this is the media tabloids such as Red Pepper who constantly report about politician’s houses, cars and lovers because they know that the society consumes that too. It is out in the open World Wide Web, past the barriers of newsprint media journalism or indeed TV music shows, that Ugandan musicians can really expose how truly American they aspire to become. However, owing to the morality of music branding, I wonder if this can be a culture which the Ugandan audience can keep up with. 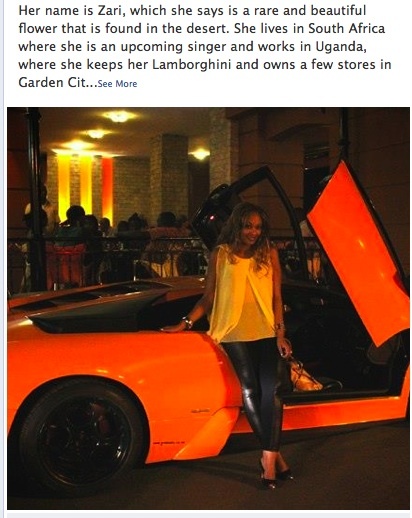 For example, in musician Zari’s case, there are only a handful of Ugandans who would spend money on a Lambourghini. The cars are not real in Ugandan society and can only be watched from a distance, in quiet admiration by the majority. When I turn back to Wilson Rd, it has become completely lost to the dominating Chinese market downtown with competing malls 10 times the size of the original Pioneer Mall. These Chinese markets do not care for high-priced American merchandise, and as a result China has set the lifestyle trends within Kampala itself. Wilson Rd, used to be a kind of fashion walk with Kabindi fashions at one end and club DV8 at the other, with several malls in-between that distributed American fashion, music, movies and magazines. While I admire how the curating of radio stations like Sanyu FM eventually provided the culture on which many of the Wilson Rd activities were based, I appreciate how Twitter has allowed for artists, musicians and performers to create their own branding and their own cultural following via the direct link between musician and music fan. However, it remains that many Ugandan musicians on Twitter or on the radio continue to produce material driven at responding to the West and Western art forms. Their tweets, ads, and promos, if not communicating directly with the West, are communicating to the West within Uganda itself. I cannot help but feel that this new Afropop culture derived from American R&B is something that speaks only to the West and completely ignores Africa itself. Though i have not fully read the article, but from my discussion with the author of the article early this week, I feel he’s so spot on. This has been my long interest: Artists appearing so western either by their dress code or accent (no offense here). Now they are using social media to reach out to their audience. But how many Ugandans can afford, let alone know how to use these social networks fully. A friend of mine and i were joking during the Easter holidays about all these so- called lads brandishing there smart phones. But they only use them to show off to their girlfriends and goggle soccer results all over the world- the unfortunate tide of sports betting!! Maurice and co, may opt for social media to reach out a new breed of audience, but unfortunately this type of audience does not appreciate what Book of Kirya is about. They will buy the album to show off as being part of Omulembe gwa Kirya…., but that’s where it all stops. We need an audience that understands what they are buying and listening to. mmmmh!! !Okulya na Balangira, tekikufuula Mulangira…..dressing up in a French style doesn’t make u a French man…that’s just evolution of Technology…..from a drum beat to a phone call, etc…while the appreciation of these advancements is also another subject to discuss, whether they are utilized positively or negatively. e.g, but one should know ‘speaking English,French, German etc…doesn’t change my originally/roots that am a ‘Ugandan’………..its just a way of having the ability to communicate/or simplifying communication/being able to deliver my message to many……so ‘social network’ doesn’t exclude me from the list of Ugandans.